Don't slave over a hot skillet for the perfect batch of homemade French fries. Get your fix with these easy CRISPY oven baked French fries. Place cut potatoes in a large bowl. Cover with cool water. Soak potatoes for 30 mintues. Lay out a layer of paper towels. Spread potatoes out in a single layer over the paper towels. Blot with additional paper towels. Spray backing sheet(s) with a layer of cooking spray. Arrange potatoes in an even single layer on the sheets. Drizzle each pan with equal amounts of the oil (usually 1 ½ tablespoons per pan. Don’t overdo it or you will end up with soggy fries). Sprinkle fried with the garlic powder, salt and pepper. Toss the fries until they are evenly coated with the oil. Arrange them again in an even layer. Bake the fries for 20 minutes. 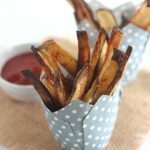 Flip the fries, then return them to the oven and bake them for an additional 5 minutes or until the fries are golden brown. Season with additional salt and pepper if desired.